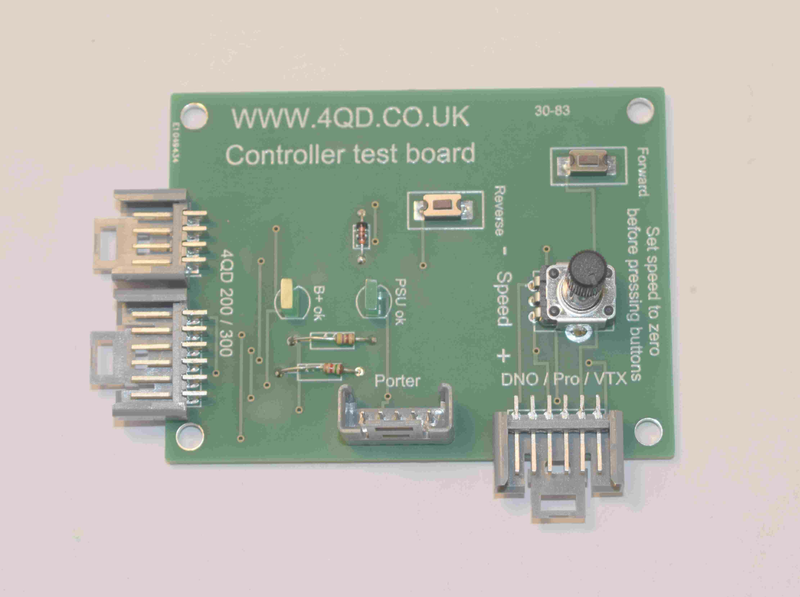 To help track down wiring issues we’ve created this multi-purpose controller test board. It works by temporarily taking the place of the normal control wiring, and helps to identify and isolate problems. For a while now we’ve been pondering how best to help customers diagnose problems with their controllers. Our troubleshooting page and checklists have proved popular and effective but we still felt that something was missing. It’s a fact that well over half of all controllers that are sent back to us have nothing wrong with them. 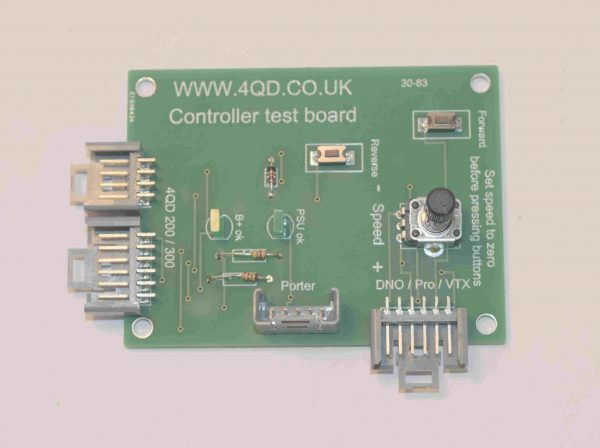 So to help track down wiring issues we’ve created this multi-purpose controller test board. It works by temporarily taking the place of the normal control wiring, and helps to identify and isolate problems. It gives basic forward, reverse, and speed control. LEDs show if B+ and B- are connected correctly, and if the controllers internal PSU is operating. It works with the following 4QD controllers [test cables included]. Free of charge to all model locomotive and engineering clubs [1 per club, club reps please contact us by email]. As a loan item to customers if assessed as appropriate during technical support discussions. For purchase [they also function as a handy little control board]. Make sure all battery and motor wiring is correct. Unplug the existing control wiring from the controller. Connect the test board to the controller using the relevant test lead[s]. The B+ led on the test board should come on. If testing a 4QD series or Pro series controller, set the speed pot on the test board to zero [anti-clockwise] to overcome high pot lockout. Press and hold either the forward or reverse buttons while slowly turning the speed pot clockwise. The PSU led should come on, and the motor start to turn.